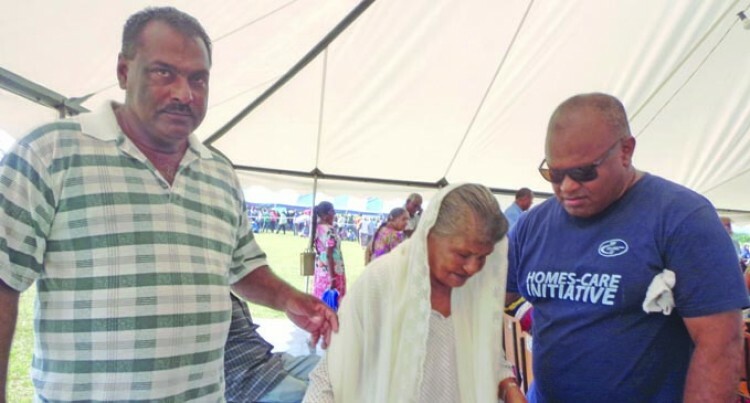 Good Samaritan Sheik Mahabob (left) with Homes-CARE Initiative Team Ba Meli Tailau assisting 81-year-old Shabira Bibi at the Ba Market Grounds on May 24, 2018. The Ba-based Good Samari­tan Taxi Company owner, Sheik Mahabob, says help­ing people is more satisfying and worth more than all the money in the world. The 54-year-old was found assist­ing some elderly citizens in get­ting to the Home CARE initiative station at the Ba Market Grounds, yesterday. “Nothing is more satisfying than helping people,” Mr Mahabob said. He met with the Fiji Sun news team while escorting 81-year-old Shabira Bibi around the Home CARE initiative station in Ba, yes­terday. Ms Bibi was one of the people in Waiwai area in Ba, whose houses were severely damaged by the flood and was in desperate need for help in terms of being transported to the station venue at the Ba Mar­ket Grounds. “She is staying alone, so I felt that being a family friend and a fellow Fijian, helping her would be the right thing to do,” Mr Mahabob said. He said during times like this, taxi drivers often increased their profits given the number of people and of customers they had. Ms Bibi thanked Mr Mahabob and the Fijian Government for as­sisting the people living in the dis­aster struck affected areas. They were on the receiving end of what she described as the worst natu­ral disaster (flood) that had ever struck Ba.